Grails is a web framework based on Groovy and Java which can be deployed into existing Java web servers, e.g. Tomcat or Jetty. Its scaffolding capabilities let you create a new project within a few minutes. Grails is based on the “convention over configuration” idea which allows the application to auto-wires itself based on naming schemes (instead of using configuration files, e.gl XML files). The Grails framework allows instance development without requiring any configuration. Grails accomplish this by automatically providing the Tomcat web container and the HSQLDB database during development. Grails uses GORM (Grails Object Relational Mapping) for the persistence of the domain model. GORM is based on Hibernate. You can test with the HSQLDB and run in production against another database simply by changing the configuration file (DataSource.groovy). 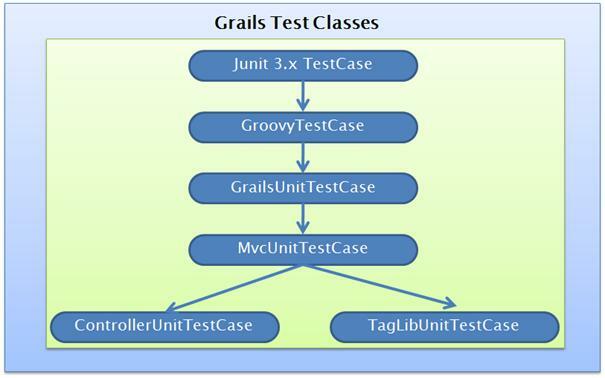 Grails uses Java EE as the architectural basis and Spring for structuring the application via dependency injection. Grails is plug-in based and provides its own build system (Gant). The Grails homepage provides several pre-defined plugins which extend the Grails framework. Provide a high-productivity web framework for the Java platform. Offer a consistent framework which reduces confusion and is easy to learn. Offer documentation for those parts of the framework which matter for its users. Powerful and consistent persistence framework. 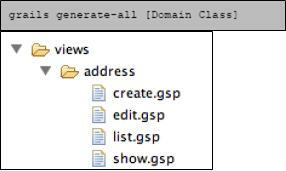 Powerful and easy to use view templates using GSP (Groovy Server Pages). Dynamic tag libraries to easily create web page components. Good Ajax support which is easy to extend and customize. Provide sample applications which demonstrate the power of the framework. Provide a complete development mode, including web server and automatic reload of resources. 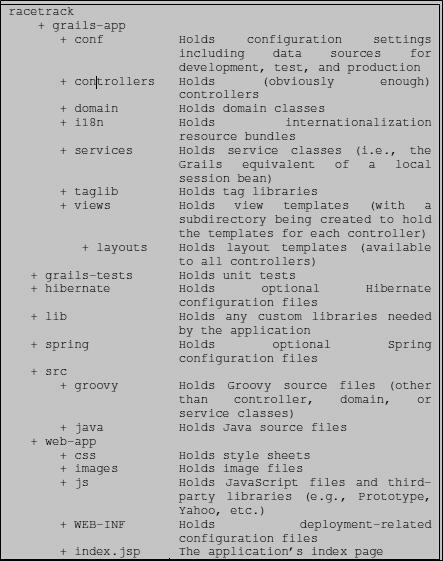 Grails is an open source web application framework which leverages on Groovy (Figure 2: Grails is build on top of Groovy). It was first developed in 2005 and the first “1.0” release was announced in 2008 . Grails builds on several well-established software frameworks, and combines their functionality via Groovy. These frameworks include Java Enterprise Edition (Java EE, JEE), spring, Hibernate and Quartz. Grails combines the speed of scripting languages with the stability and security of Java and is therefore ideally suited for enterprise use. The Grails project structure (shown in Figure 3 below) relies heavily on convention and establishes a sensible organizational structure for an application’s various artifacts. Point the JAVA_HOME environment variable at your JDK installation. Download the latest release of Grails from http://grails.org/Download. Domain classes are the lifeblood of a Grails application. 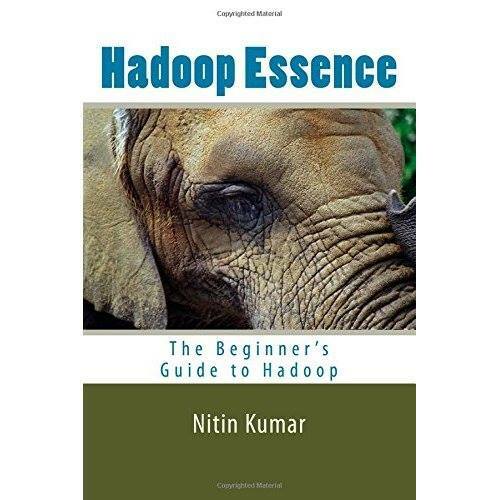 A corresponding database table is automatically created for each domain class. Controllers and views derive their names from the associated domain class. This is where validation rules are stored, one-to-many relationships are defined, and much more. Controllers and views round out the “Big Three” in Grails applications. The Model/View/Controller (MVC) pattern is undoubtedly familiar to most web developers. By enforcing a clean separation of concerns among these three elements, your efforts are paid back in terms of maximum flexibility and reuse. In this example, the ‘Address’ domain class will be scaffolded. The Controller and Views will now be generated for the developer. The way the code is generated, is based on templates that can be changed. Next to the CRUD actions, Grails adds the “list” action. The “edit” and “save” functions work together with “update” and “create”. The AddressController now looks like this. The functions are self-explanatory. Dynamic Scaffolding in Grails is really easy. This can be achieved by adding the following line inside the controller that needs to be scaffolded. View and Controller will be generated based on the Model and will automatically implement CRUD actions. Here we will expose the default scaffolded Controller code so that and relationship between actions in the Controllers and the URL. It will also allow us to see the relationship between action and the corresponding Groovy Server Pages (GSPs). Controller will be generated using scaffolding not only it generate controller but also generate GSP view using def scaffold =true. The first part of the URL is the application name, or Application Context Root. The next part of the URL is the controller name. Notice that the Controller part of UserController gets dropped off, and the first letter is changed to lowercase. After the controller name, you’ll see an optional action name. This name corresponds directly to the action in the Controller. If we try “http://localhost:9090/application/user” in our web browser, we will end up with an empty list of users. Since no action is specified, Grails routes the request to the index action. The index action, in turn, redirects the request to the list action, passing along the query string as well. The name:value structure used in the redirect method is used throughout Controllers. Grails uses GSP for the presentation tier. The Groovy in Groovy Server Pages not only identifies the underlying technology, but also the language you can use if you want to write a quick scriptlet or two. Groovy Taglib and partial templates give you a more sophisticated way of sharing code and behavior across Web pages. GSPs are the foundation of Grails’ page-centric MVC world view. The page is the basic unit of measure. The List page offers links to the Show page. The Show page allows you to click through to the Edit page, and so on. Whether you’re a seasoned Struts developer or a recent Rails enthusiast, you’re already familiar with this type of Web life cycle. Variables placed in request scope last just long enough to be displayed in the response and then are discarded. Values in flash scope (commonly used for error messages in Grails) can survive a single redirect. Session scope is used for values that should stick around for multiple requests, but are limited to the current user. Values placed in application scope are “global”—they last for as long as Grails is running, and they are shared across all users. GrailsUnitTestCase and its offspring offer mock services that replicate the services available in integration tests, without incurring the overhead of running the real services. A GrailsUnitTestCase makes three convenience methods available: mockForConstraintsTests(), mockDomain(), and mockLogging(). Normally you would have to create an integration test to write assertions against this functionality. And you still can, if you’d like. But knowing that unit tests run much faster than integration tests, it’s nice to be able to mock this behavior out. For example, suppose that you’d like to test the validation on the User class. Command “grails clean” will clean and to make sure that there aren’t any lingering development-mode artifacts hanging around. No additional server configuration is necessary to deploy your WAR – it includes the Groovy JAR, the Grails supporting JARs, and everything else that you added to the lib directory. Grails’s main target is to develop web application quickly and rapidly in agile manner. Grails is based on Convention over configuration and DRY(Don’t Repeat yourself) and not only that we can re use existing java code in Grails that give power to build robust and stable web application in quickly and rapid manner. This paper explained the usage and best practices around the Groovy and Grails. This entry was posted in Groovy & Grails, Main and tagged Grails, Groovy. Bookmark the permalink.